This is a review and discussion of the live action Pretty Guardian Sailor Moon series Acts 17, Minako Transforms in Front of Rei’s Eyes, and 18, At Last, All 5 Sailor Guardians Are Together. These episodes aired on Japanese television January 31st and February 7th 2004. 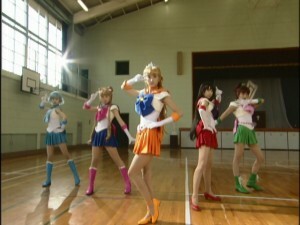 They focus on the appearance of Mamoru’s girlfriend Hina and the shipping of Sailor Mars and Sailor Venus. Act 17 starts off where Act 16 ended with Usagi running into Mamoru and Hina. They do this awkward thing where they reshoot the events of the last episode which sort of already happened, having Mamoru react to seeing Usagi with Hina on his arm. 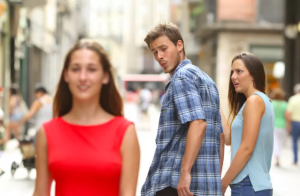 I can’t help but notice how similar the scene of Mamoru looking at Usagi while Hina looks at him is to the recent meme of the “Distracted Boyfriend” or “Man Looking at Other Woman” which I’ve posted about a number of times. I’ve included both for reference. Hina asks if that girl is there to see him and Mamoru, being totally awkward and ignorant, assumes she is not because she didn’t speak up. He really should know better! The source of the conflict here is not Hina but Mamoru! Hina is portrayed by actress Moeco Matsushita who we’ll be seeing for a number of additional episodes. Meanwhile Minako continues to be on the run! We see that she’s hiding out in a hotel with a painting of a greek temple on the wall. Is she in Greece, like she did in the Sailor V manga? Almost certainly not as she quickly ends up hiding out in a Church in Tokyo and then back at the hotel, so it’s likely a local one. We see Minako faint, which is the first tangible indication of her mysterious illness which will be a plot point for most of the rest of the series. The specifics of this illness are never explicitly described but for the purposes of the show it’s some sort of supposedly terminal illness which she is suffering. In the interest of those who may not have seen the entire series I won’t get into more specifics until they play out. At school Usagi’s home ec teacher, or whatever we call that kind of class in Japan, is giving the students a project to make a scarf and give it to someone special such as, and she actually suggests this, a boyfriend! This seems like a large amount of pressure to put on a bunch of young teenage girls but whatever I’m no educator! Usagi is clearly torn as she wants to make the scarf for Mamoru but that would be mildly inappropriate given he apparently has a girlfriend and so she instead decides to make the scarf for Tuxedo Mask because that’s a totally different person. She picks out the perfect yarn to match Tuxedo Mask, which is white, and proceeds to neglect her knitting as she drowns her sorrows in some very intense karaoke of, naturally, “C’est la vie”. While the scarf is only partially complete Usagi literally runs into Mamoru and Hina. Hina’s reaction? She’s apologetic and deeply concerned that Usagi may have ruined her scarf which is clearly intended for a special person who she doesn’t realize is actually her boyfriend. A lesser show would have made Hina evil so that Usagi would be justified in trying to steal her boyfriend. This isn’t a lesser show! It’s Sailor Moon! By making Hina a kind and caring person it just complicates and puts a more realistic spin on this drama. Most love triangles don’t involve a “good guy” and “bad guy” pining after the same person. The real world is more nuanced! Usagi is devastated by this finally empathizing with Hina and realizing what a nice person she is. It is the anniversary of Rei’s mother’s death, meaning that she died around January 31st. 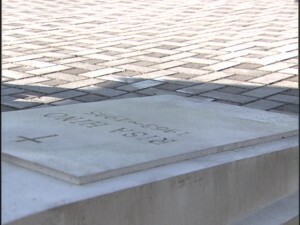 Her tomb stone notes that her name is Risa Hino and that she lived from 1963 to 1995. This puts her at about 32 years old when she died. Rei is about 14 at the beginning of the series, in 2003, so she would be about 6 when her mother died. This seems to roughly fit with the age of the various versions of young Rei we see in flashbacks when her mother dies. Rei would have been born when her mother was around 26 which also seems like a pretty reasonable age to have a child. No inconsistencies here from the prop department! Risa Hino is buried, or at least has a grave marker dedicated to her, at a Christian church in Tokyo. This seems a bit odd to me as I learned from a fantastic book, Warriors of Legend: Reflections of Japan in Sailor Moon, that only foreigners are usually buried in Japan as laws require Japanese born citizens to be cremated. Rei appears to be fully Japanese and Risa is a common Japanese given name not often found in other cultures. Still this church has an English speaking white priest who has an accent when speaking Japanese and occasionally says things in English. While speaking to the priest we learn that Rei hates her father for working while her mother was dying. Speaking of this church, it’s clearly not a real church! Well not all of it. The various signs refer to it as “St. Juban Church”. How to break this down… a Saint is a person, generally a human, who is determined by in this case the Catholic church to be holy and given the title of Saint. Juban is a place, not a person. It is a reference to Azabu-Juban (or Juuban). It is a neighbourhood in the Azabu district in Tokyo. One might wonder if Juban is named after a person who might be the Saint this church is referencing? Not really possible. Juuban means “10th” or “Number 10″ so it’s like saying the 10th neighbourhood in Azabu which means it isn’t named after a person. St. Juban is not only not an actual Saint but the concept of such a Saint doesn’t make much sense. Further a lot of the shots of this church are clearly just taking place in a gymnasium which looks like a school gymnasium. It actually looks very similar to the gym that Minako plays volleyball in Sailor Moon S episode 100, I Want to Quit Being a Sailor Guardian: Minako’s Dilemma. I know there is a school gym later in the series but I don’t recall if it’s the same set. Do some churches include school type gymnasiums? This seems plausible but I’m not expert in the Japanese Christian Church scene. The area, which has a podium and projected cross on the stage, clearly has basketball nets visible as well as lines on the ground for various sports. My primary school and many others I’ve visited had this sort of gym/stage set up so that large gatherings such as graduations or school plays could be held in the gymnasium rather than requiring the school to have a large and expensive auditorium. Another variant on this type of amalgam is the cafetorium, which is a mix of a cafeteria and auditorium. While a lot of the action in Act 17 takes place in the gym there are also other parts to this church including a proper chapel. While these could all be part of a real church in Tokyo, which I couldn’t find any specific information on, it may also be the case that these are just a number of locations used for these episodes that were dressed up with a few prop crosses and Christian decorations to make them seem like part of a single church. Alternatively the gymnasium may have been part of a school affiliated with the church. As a child I attended cubs at a Christian school which was next door to an affiliated church which I also attended at Christmas time. The school and church shared and name and both had crosses and Christian imagery displayed throughout. That school’s gym also had a stage in it! This church is the stage of major Minako/Rei shipping! This is a prominent friendship and somewhat complex relationship of the series and this is just the beginning. Minako nearly immediately notices that Rei is Sailor Mars, because she’s good at that, but Rei can’t do the same. Instead she seems to notice something but it’s actually that Minako is well known pop idol Minako Aino, something that almost any other girl her age would have noticed. This reminds me a bit of Usagi who fails to recognize who Seiya of the Three Lights is despite the fact that he’s a big star. Minako was at the Church praying which may insinuate that she is Christian in this continuity. Though Rei is visiting her mother it’s not clear how much she may be an observing Christian. She attends a Catholic girls school in the manga and anime despite being a Shinto priest. She may simply be visiting her mother’s grave though she is kneeling and praying in a Christian fashion. 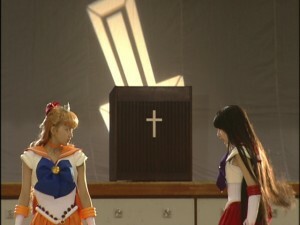 I wonder if either Minako or Rei feel that their own godlike powers are at odds with their various religious beliefs. My understanding of religious beliefs in Japan is that many people will simultaneously observe certain practices of conflicting religions without any real concern. There is a lost sick dog which shows up at the Church and Minako and Rei seem to think it’s their responsibility to care for him which is the excuse for them to remain around and interacting with each other for a couple of episodes. After the monster attack Rei immediately transforms but Minako hesitates, unwilling to give up her secret identity. Finally she does and we are exposed to the most ridiculous of transformation sequences to date! 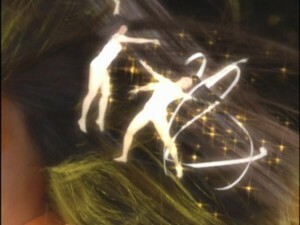 The best part is when these gymnastic dancers frolic through her hair to make it blonde! I guess in the continuity of the show this is their actual hair and not awful wigs! During the fight Sailor Venus is injured by an exploding sword and Sailor Mars stops to help her, still under the impression that she is Princess Serenity. Sailor Venus chastises her for this and so we are introduced to the Venus/Mars conflict which just make this ship that much better! Act 18 again starts where we left off, with Sailor Mars and Venus fighting! Sailor Mars doubles down saying she wouldn’t have had to stick around if Venus had been better in battle! Venus insists that she doesn’t want to be protected by the rest of the Sailor Guardians. How odd! She’s the Princess, isn’t she??? Later in the episode she clarifies to Sailor Mars that she should never leave Sailor Moon’s side and that this is an order from the Princess! What a curious order from someone who we should suspect is the one that should be protected! The Rei/Minako feud continues in the form of taking care of the dog! Rei shows up with a big bag of cheap dog food so moneybags Minako goes out and buys premium healthy canned dog foot! All well and good but he’ll get sick if he’s not used to eating wet food. Rei refers to the dog as Taro and Minako refers to him as Riki. In order to help find Taro/Riki’s owner the two make signs. So they make a little flyer with a photo of the dog on the computer and make some photocopies because it’s 2004 and such a thing is easily done? We did see Minako use Photoshop Elements not long ago! Well no. Each of them hand paints a lost dog sign complete with a painting of the dog! Rei puts up her small but fairly elaborate sign and Minako, who should be working on her new album, hangs a much larger sign! Humourous if not completely ridiculous! This of course is a proxy fight taking the place of their actual argument which is rooted in misunderstanding. We can note here that Luna seems to share knowledge of Sailor Venus’s identity as she is there at the poster feuding and speaks to Minako. When speaking to Artemis Minako seems to regret what she said to Rei but the next time she sees her she spews out the exact same arguments! Why don’t these two just get along? Meanwhile Usagi’s scarf isn’t going well. Her teacher calls her out and says it’s more like a handkerchief. Hilarious! She’s already given two handkerchiefs to Tuxedo Mask/Mamoru. Why not a third to go with his collection that he has going on his nightstand? While confiding in Makoto and Ami she reveals what we’d all figured out. She wasn’t really thinking of Tuxedo Mask when she was making this thing. She was thinking of Mamoru. Well okay she was actually thinking of Tuxedo Mask anyway but she didn’t actually know that. In her mind they are still separate entities. Makoto’s reactions to Usagi’s unfolding emotions are impressive. Just seeing the look in her face shows so much. She’s really feeling Usagi’s pain and, knowing what we do about her recent unrequited love, I like to think this also played into the way she acts and feels here. Ami similarly feels pain for Usagi but she doesn’t have the emotional baggage to really feel it like Makoto does. Makoto has some advice for Usagi! Don’t give up even if he has a girlfriend! She might not stick around! This reminds me of episode 30 of the original Sailor Moon anime, Total Chaos: the Messy Love Rectangle, in which Usagi and Makoto find out that Motoki has a girlfriend and Makoto is unphased! Of course in this continuity Motoki is quite single, so Makoto arranges a meeting with him to grill him about Mamoru’s girlfriend. Have I mentioned I’m shipping these two? This isn’t the first hint at a relationship between these two we’ll see and there’s more to come! Motoki is disappointed that Makoto wasn’t interested in a date with him, but Makoto gives him some turtle food and all is well. Motoki confirms that Mamoru indeed has a girlfriend and that her name is Hina. He says that Usagi should give up on Mamoru since he and Hina are in love. That’s great Motoki! Where was this wisdom when Naru asked him for Mamoru’s contact information so that she could set Usagi and him up? I guess Motoki just isn’t that great with women. Now that we know a bit about Hina, we get a bit of backstory. Hina and Mamoru have known each other since they were children when Mamoru said that one day he’d marry Hina! I used to say stuff like this to girls when I was like 5 years old as well but I never married any of them! If you liked it, Mamoru, then you should have put a ring on it. With all the jewellery theft he does in his night life he had ample opportunity to make it official! Right so we see young versions of Hina and Mamoru in this one scene and as luck would have it the Church that Hina wants to get married in is none other than St. Juban Church, home of the holiest church gym in all of Tokyo! In this case they are in a legit church, where the priest turns out to be the monster who actually was a separate entity in episode 17 but whatever. The monster probably possessed the priest. Everyone is knocked unconscious except for Mamoru and Hina who escape to the church gymnasium and pass out! Everyone is called to the church gym and for the first time in the series all five of the Sailor Guardians are together! There’s a cool series of shots that takes place here showing all of the Guardians in order with Sailor Venus, the Princess, in the middle. Seen from a different angle however we see the Sailor Guardians with Sailor Moon in the middle. The camera lingers on this shot for a moment. What could this mean??? If you haven’t figured it out you probably aren’t paying attention and aren’t familiar with any other continuity! This is the part in the series where the online arguments between the Sailor Venus is the Princess and Sailor Moon is the Princess camps became really heated. I recall someone at the Genvid forums pointing out this fact and it seemed like a slam dunk to me. There’s even a basketball net in the background! Dunks for Jesus! Back at the hotel room Minako is chatting with Artemis. He suggests that she may be pushing away the other girls in order to spare their feelings. She mentions that she only has 6 months left. Six months until what exactly?